When you are getting prepared for the most significant moment in your life, the marriage, everything has to be perfect. Whether it is the selection of clothes or menu, venue of the marriage or choice of jewellery; you must pick only the best stuff from the best Gold Shops in Mangalore. Want to know about a few tips that make life easy for you? Here are they. Every woman wants something exclusive in her jewellery. When you need trendy jewellery, TDF is the one-point solution. It can give tailormade items that suit everyone’s pocket. What is multiuse jewellery? It is nothing but a ring that can also be worn as a bangle. A pendant that can become a ring or a necklace that can also be worn as a bracelet. Doesn’t it sound exciting? Yes, it is a reality, not just imagination. In the era of modularization, even your jewellery also should be modular. Thus, you need to keep a limited collection, but there is no limit to versatility. What kind of wedding ceremony are you going to attend? If it is your wedding, then what is the theme you have chosen? The choice of jewellery largely depends on the wedding occasion. 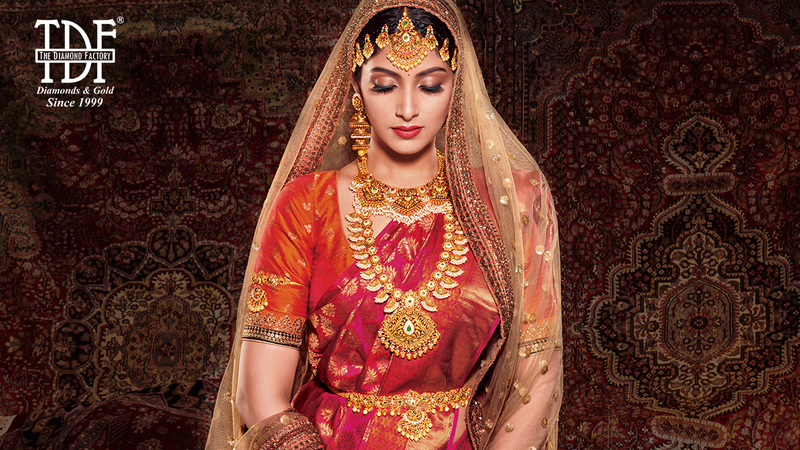 A traditional wedding at some iconic place needs heavy, conventional designer jewellery. A modern wedding ceremony demands lightweight, trendy stuff that gives the perfect blending of modern designs and traditional looks. With TDF, you can choose from the wide spectrum of designs and styles. The only thing you need is a lot of patience and time to select your favourite items. It is really crucial because you must look gorgeous in the wedding event. Whether it is your marriage or someone very close; the choice of jewellery has such that it not only matches the skin tone but enhances it in the photo shoot or video shoot. You should look gorgeous in every frame of the shoot. After all, you pay for it. Hence, when you go to one of the finest Jewellery Shops in Bandra West, don’t do the purchase hastily. An oversized maang tikka doesn’t look good. Similarly, a tikka that is too small takes away all the charm of your face. You should try more than one items before you finalize one. It is always better to take someone along when you do the shopping at the Famous Gold Jewellers in Mumbai. Ask candid view to your companion. When you do jewellery shopping for the wedding, choose smart and stylish stuff. Modern jewellery such as designer bangles, statement necklaces or cocktail rings gives an exclusive look. The wedding ceremony (or any other event for that matter) you attend is special and exclusive. Therefore, it is essential to buy special jewellery from Top Jewellers in Mangalore. Undoubtedly it is costly, but heritage jewellery is something you must give a try. If affordability isn’t a problem, you can achieve incredible satisfaction with it. Gutapasulu jewellery is an example. Whether it is a lightweight necklace set or heavyweight bridal jewellery; you get value for money when you buy the stuff. When you shop for an engagement ring, buy a wedding ring as well. It is always better to buy the pair so that there are harmony and coordination between the two designs. Though there is no such rule that your engagement and wedding ring should be similar, it is always better to have it. Again, it is a unique idea, but it is a logical thing. When you buy the wedding dress first, and then search for the matching jewellery, you have a limited choice. Also, you will not have any other choice than buying the most suitable stuff even if it is extravagantly priced. When you buy the jewellery first, it becomes easy to pick a wedding dress that goes in tune with it. Since the wedding dresses are always less expensive than the jewellery, you are at the least risk. Do you have pure gold that you bought before two decades? Or do you have inherited gold coins? If yes, then it is always better to exchange it while buying new jewellery. TDF offers full value for money for it. There are two benefits of using old gold; you need not to spend on buying gold, and you get special discounts on making charges. Gold Shops in Mangalore give preference to exchange the old gold. It is the symbol of purity and genuineness. You have a brilliant option of getting customized jewellery at TDF. The innovative initiative helps the bride and the family members to arrive at new ideas and innovative designs. The team talks to the customers and plan the whole collection for the entire event. From the Sangeet ceremony to wedding reception, each event can be planned and customized. When artisans and designers put their sincere efforts into bringing the best ideas into reality, the customers get not just price benefit but the total satisfaction.